50% of the price quoted for the stay will be charged for cancellations and no shows. Deposit is required to complete your reservation. If your group is larger than 35, please contact us to see if we can make the proper arrangements hostalantigueno@gmail.com. Also if you have any specific requirements, we would love to make the proper arrangements for you! Join us to live the best experience of our beautiful city! - Organization of tour or transport to pretty much all Guatemala and Central America best places (Acatenango Volcano, Atitlan Lake, Semuc Champey, Copan, Coffee Tour etc.). Also, as we are use to receive and take care of large groups, we can gladly set up cinema or meeting area. Amazing hostel! Loved our stay here, felt completely comfortable and at home. Especially liked the garden to chill in and the super cute dog. I would definitely stay here again! Excellent hostal! Christian was so kind and helped us with all aspects of our trip and to get to our next destination. 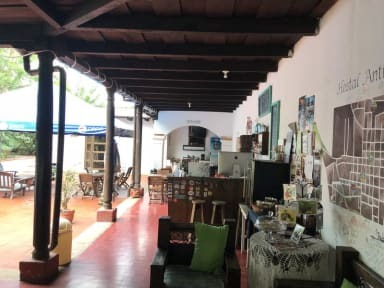 Breakfast was really good and Antigueno was a friendly, safe and excellently located hostel. !Gracias por todo! A perfect place as a place to stay while exploring the city. The people working there were extremely helpful with everything. We are going back to this guy in a few weeks, and for sure we will stay at this place again. Beautiful and quiet location, nice rooms, and very friendly staff. Highly recommended! This hostel is really nice, with a massive courtyard with lots of seating and tables plus a beautiful garden. Rooms are clean, but bathrooms are pretty far in the back. It's a bit of a walk from the center... 10+ minutes, but seems to be on a peaceful, quiet street if you want to be away from the buzz. Great value for the money! We met friends in town so we didn't hang around the hostel too much to meet others. Owners are so sweet, they packed me a small lunch for my 4 AM shuttle! The staff here only speak Spanish. There is no hostel vibe or social aspect to this hostel. The hostel does have a kitchen but they charge you extra to actually use it. There are no lockers in the rooms. Rooms and bathrooms were clean. A little bit out of the way but good location of visiting the lookout point. 230am. We had to knock on the door twice before the only staff member there opened it. That’s a security concern I do not approve. The lights and water were turned off. To me that’s not 24h reception and security. The toilets would not flush and sink didn’t work until I had that staff member turn it on. There was diarhrea in the toilets. I understand saving water and energy, but when I have to go, I don’t have time to find the someone to turn on the water. That staff member had poor attitude.